Shri A. J. Uttam was an outstanding progressive writer, critic, journalist, editor and very well known for outspoken, consistent well studied and documented opinion. In fact he was called the walking, talking and living encyclopedia of Sindhi literature. Shri A. J. Uttam (Or Assandas Jethanand Uttamchandani) was born on 16th December 1923 in Hyderabad Sindh (now in Pakistan). He always said, I attribute my love for Sindhi language to my mothers influence and out-spoken nature to my father. He displayed organizational abilities and literary skills at a young age even before completing his matriculation in 1942. He organized the Hyderabad Student Union in 1941 and became its Gen Secretary. In 1942, after passing matric and joining college, he participated in Quit India movement and courted one year imprisonment on 9th August. In 1941, he had already started writing short stories, essays and research articles on literature and criticism and some were published in daily and weekly newspapers. He contributed to Phuleli, the college magazine of D. G. National College and was elected its editor in 1946-47 after his release. He formed a progressive writers group in 1946 in Hyderabad - Sindh, which held weekly literary study classes in which famous writers like Lekhraj Aziz, Professor M. U. Malkani, Tirth Basant, Prof. Gehimal Mulchandani and Kalyan Advani & revolutionary poet Haider Bux Jatoi and others participated/attended. Here he also interacted with other progressive artists like A.K. Hangal, Gobind Malhi, Shaikh Ayaz, Anand Golani and others. When he was the editor of Phuleli in 1946, a young beautiful and intelligent reader, Miss Sugni Narwani was attracted by his short story of an anti-dowry ideal couple named Taraki-a je raha te(On the path of progress) and incisive articles of high principles and social issues. She became his life partner in marriage on 14th November 1947. She is known to you all as Smt. Sundri Uttamchandani, today a leading Sindhi writer of novels and numerous short stories. The support and guidance of A.J. Uttam played a major pivotal role in her literary development and success. In January 1948 when the riots broke out in Hyderabad Sindh, he reluctantly migrated from Sindh. One million Sindhis were uprooted from their land and had to struggle hard for livelihood. In spite of all hardships, he firmly believed in working wholeheartedly for keeping the Sindhi Language and Culture alive. His educational pursuits were rudely interrupted in Sindh due to partition. However he cleared his MA Examination in March 1949 in Bombay. After results, he got a job in Bombay Secretariat in the same year,but continued to work for Sindhi language and culture through Sindhi Sahit Mandal and Naeen Duniya monthly, which according to Prof. M. U. Malkani gave rebirth to Sindhi literature in India. A. J. Uttam was one of the pioneers of the first premier literary and cultural organization - Sindhi Sahit Mandal which was formed in January 1949 under the presidentship of Prof. M. U, Malkani in Bombay, the well-known dramatist and Historian. A. J. Uttam held the post of General Secretary and Vice President. The Mandal encouraged upcoming writers. Here many writers sent their writings to weekly study class. The Sindhi Sahit Mandal eventually evolved as the seat of Sindhi literary and cultural activities. It started the Sindhi language recognition movement in 1952 with five writers committee including Mr. A. J. Uttam. It held annual sammelans which included cultural programmes by Bhagwanti Navani, Smt. Sundri Uttamchandani, Savita Babani, Shivo Ramnani, Loku Hemrajani, Moti Prakash & others. Here young, enthusiastic and energetic writers and artists took part along with senior and elder writers and educationalist like Prof. M. U. Malkani, Ram Panjwani, Lekhraj Aziz, K. B. Advani, B.H. Nagrani, Dharmdas Khitritriya etc. In 1956, Prof. M. U. Malkani took Mandals delegation to Delhi at Asian Writers Conference, inaugurated by Jawaharlal Nehru. Prof. Malkani (President) and A. J. Uttam (Vice President) and others met Rashtrapati for recognition of Sindhi Language (which was not included in the constitution in 1950). Sindhi was recognized from 1957 for Sahitya Academy Awards and Radio Programmes which continues till today. Naeen Duniya, a progressive monthly magazine was started in India after partition in 1948 by Biharilal Chhabria and Uttam worked as a co-editor from 1950. From 1957 till his death he continued to publish Naeen Duniya as its whole and soul, wherein, he had published over 500 original stories, over 1000 poems, 200 essays and dramas, and published 100 books. Uttam had inspired and encouraged new writers through Naeen Duniya and giving them remuneration for their literary contributions. This was his unique contribution to Sindhi Literature & culture. Uttam had devoted his full time, energy, resources and capabilities for promotion of Sindhi literature, language and culture. Initially, it was through Naeen Duniya and Sindhu Dhara, thereafter through the newly central organization Akhil Bharat Sindhi Boli Ain Sahit Sabhaformed in 1959. He became the Founder General Secretary of the Sabha and was re-elected at sammelans as the General Secretary in 1960, 1961, 1962, 1963 and later 1970, 1971, 1972 and 1973. He galvanized the Sabha into a true central representative organization of Sindhis for Sindhi language in Arabic script. The crowning success of all efforts was the inclusion of Sindhi in the eighth schedule of the Constitution in 1967 after 16 years of struggle and hard work by all, which was not included in the Constitution in 1950. Many issues of Naeen Duniya could be classified as Collectors Issues specially focused on literature and writers. He had also edited special issues of weekly Jhulelal, (Ahmedabad). With the special issues of Naeen Duniya, he became so popular in Sindh, that he was invited to visit Sindh to attend Shah Latifs Annual Urs in 1964. There he met top most writers and educationalists. After his personal visit to Sindh he was called the Bridge of Sindh & Hind. He edited special issues of Dharmyug & Sarika on Jeay Sindhin 1972. In 1973, A. J. Uttam was invited to the World Writers Conference in Russia, where he came in personal contact with Marathi Peoples Poet Narayan Surve and other famous Indian writers like H. R. Bachchan, Bhisham Sahni, and Bengali writer Subhash Mukherjee. There he met famous Urdu writers Faiz Ahmed Faiz, Sajjad Zaheer and Chilean Nobel Prize Poet Pablo Naruda. There he saw the love of Russians for India esp. for Gandhiji, Nehru & Smt. Indra Gandhi. 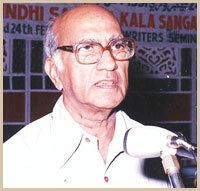 A. J. Uttam was editor of Sindhi Dailies - Sindhu Samachar from 1973 to 1975 and thereafter Sindhu Sansaar from 1975 to 1978. The latter was a Herculean task. It became very popular and was appreciated by all. Our oldest writer, Prof. M. U. Malkani, wrote in his opinion in Sindhu Sansar on 16-01-1978," In young Sindhi writers, Uttam is my earliest friend. I have noticed that behind his serious nature, a sensitive heart is hidden which is now revealed after he has started his daily (Sindhu Sansar). His news on the sorrowful incidents of the world are so full of pathos which show his love for humanity. The basis of his socialism and progressivism is that love for humanity which an English poet has called the Milk of Human Kindness. His editorials are exemplary and full of weighty arguments which give testimony of his mature and ripe personality. Their special quality is that they are impartial, which helps the readers to form their opinions. The main thing is that wherever the question of the progress of Sindhi Community, he will discuss extensively. Therefore Sindhu Sansar has really become the medium of the ideal Sindhyat. His language is rich in flavor, with idioms from which many Sindhis can learn a lesson." In 1984, Uttam went to Japan to his daughter Bina. And there in Heroshima, he saw the havoc played by Atom Bomb blasts by USA Imperialists. On return, he went to Hong Kong and China. There he saw 2-3 temples with Buddhas statues like those in India. A. J. Uttam had written about 100 short stories some are in two books 'Kashmkash' and 'Hoo Jehan hi Manu'. Some of his stories were published not only in India but also outside in other languages and also in Sindh. In 1961, he wrote a short story Kaflo wadhando rahiyo(caravan went on). The heroine of the story refused to marry the person who asked for Dowry at the time of wedding. This story was in the collection of Kashmkash. Infact, prof. Malkani liked Uttam's collection 'kashmkash' so much that he called him the front rank story writer. Uttam had about 15 books of essays to his credit. All these contained critical appreciation of classical writers like Kalidas, Meera Bai, Guru Nanik Dev, Shah Latif, Sami, Sachal, Tagore, Munshi Premchand, Sharat Chander, Sant Gyaneshwar, Mahatma Gandhi, & Lenin. His other famous book of Sindhi Kahani Nataku Ain Tankida contained historical & critical evaluation of stories, drama and criticism. He had written three monographs on biography & works of M. U. Malkani & Lekhraj Aziz - 1985, Kalyan Advani - 2002. Some of his books are prescribed for BA and MA students in the University for their Courses. Uttam was honored with special shield by Progressive Writers Association Golden Jubilee meet at Lucknow in 1986. He was honored with Gold medal in 1994 by Maruee Organization, Delhi. He was honored by Deputy PM, L. K. Advani in 1999 at the conference called by Indian Institute of Sindhology at Gandhidham. It is clear and obvious that as stated by Prof. M. U. Malkani, Uttam's study was very deep about Sindhi language, literature and culture for which purpose, he had collected thousands of Sindhi old and new books. He had a very good library of Sindhi books, which very few institutions in India have. Many people came to him for books and advice on Sindhi Literature. Recently, well known writer Rukmini Chainani compiled a book on Uttam Sindhyat Jo Upasakin 2002, a real Tribute to Uttam. Late Shri Goverdhan Mahaboobani "Bharati"